Three struggling theatrical performers meet a famous songwriter who is trying to convince a wealthy oilman to finance a musical he is scripting, promising them stardom if it comes to fruition. A series of misunderstandings leaves a married man believing he has impregnated the owner of an adoption agency, and that she will be his and his wife's surrogate. Gary Mitchell: Lovely girl. Lovely singer. Handy with a knife, too. The familiar story line (with a musician rising from being a nobody to being a well-known and recognized star) is often delivered in a boring and either over-sentimental or spiritless way by other movies of this kind. In contrast, "My Dream is Yours" combines an original, heart-felt story with a good script and excellent direction. And there is Doris Day at the age of twenty-five! She may already appear quite charming in some of the better-known comedies that were produced ten or fifteen years later. Here her performance is so delightful to look at and her singing so refreshing to listen to that I was overwhelmed. 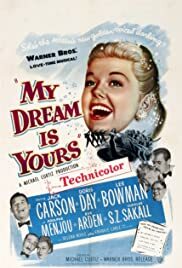 If you like Doris Day, you simply have to see this movie.